Exit I-5 at Exit 120 between Olympia and Tacoma. Enter North Ft. Lewis, using right lane. Turn right at light; veer to right a Y. Good signage. All of our 48 sites are reservation only. Reservations may be accepted up to one year in advance. Cancellations or changes must be made 30 days prior to day of check-in to receive a full refund. From 30 days until 7 days prior to check-in, a 75% refund will be granted. Cancellations made within 7 days prior to the day of check-in will receive a 50% refund. Phone connection in office. Free W-Fi has been added in the commons area on Loop 100. 14 day stay limit from May 1 - Sep 30, with 14 day extension possible is space is available. 28 day stay limit from Oct 1 - Apr 30, with 28 day extension possible. 28 stay limit all year long. 3 day stay limit in overflow. Lake View RV sites are $5 more more night. 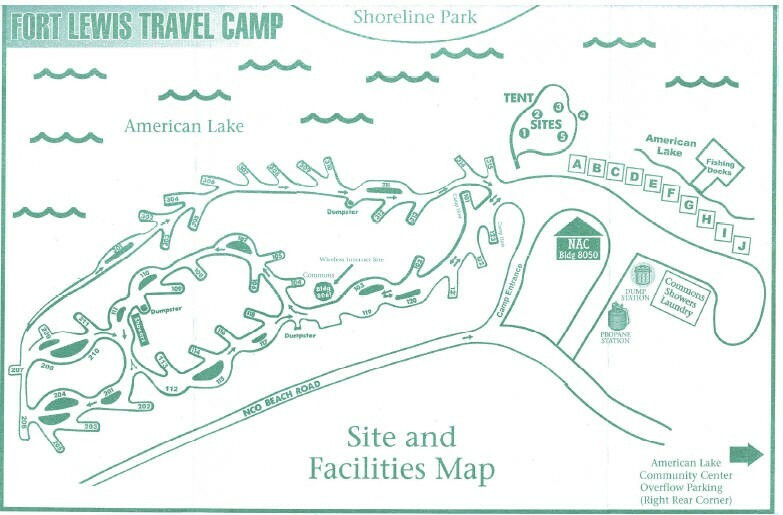 Free sites are located at Chambers Lake and Lewis Lake with no services. Cabin prices vary on type of accommodation. Cabins available from Studio to Three bedroom. All cabins come with full kitchenettes. This includes stove, oven, microwave range, pots and pans and table service for four. All cabins have basic cable and telephones with local number access. All have showers and full bathrooms as well. Cable TV limited without a HDTV. Cable TV in the RV Park requires a cable box be obtained from the office (when open) with a $50 deposit. Allowed with a completed HUB Form 816-1 (Registration of Personal Firearms) on file with the Provosts Marshal's office. Our state of the art outdoor facility opened, featuring a beautiful community of recreational cabins, is an absolute hit with Soldiers and their families looking to get away and live the great outdoors fantasy. 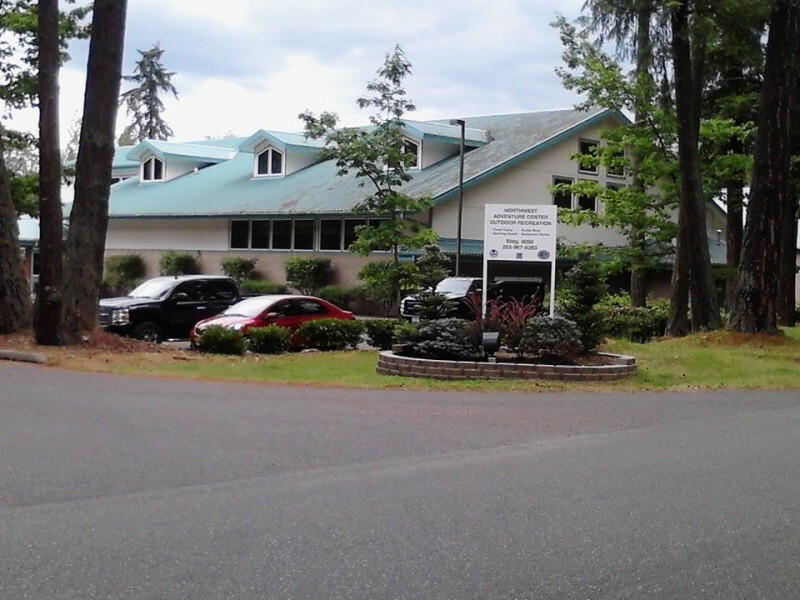 Our cabins and RV Park are nestled in a quiet corner of American Lake on North Fort Lewis. American Lake is a recreational dream with fishing, boating and swimming as major draws. Fishing is available only steps away from your front door. Ducks, geese and mating pairs of bald eagles can often be seen enjoying this oasis along the I-5 corridor. There are signs to the RV park from the gate, however, there isn't any signs indicating the actual RV travel camp entrance. 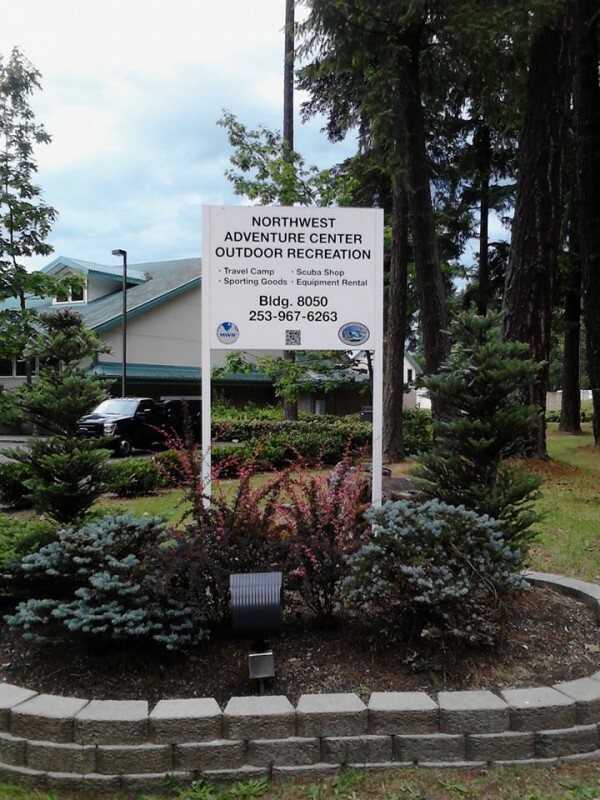 The camp entrance is the Northwest Adventure Center entry point. Even if you go pass it, there is a huge parking lot further down the road you can turn around. That's what I had to do. No WiFi, or OTA reception due to trees however cable is available. Just need to pick up the converter box from the Rec Center for a deposit of $150. Other than that, great RV park. Location is right on American Lake and snuggled in the trees. Several of the spots are pull through, which is convenient. Cleanliness of 2 of 3 bathrooms is very good. Third one looks like it might fall down. It needs to be replaced. Park hosts are very nice and helpful. Office staff were great. Biggest complaint was the non existent dumping of recycle containers. Never saw them emptied while we were there. WIFI worked in two of three facilities. Just not up to the Navy's standard. Watch out for low hanging tree limbs. This is an area that needs serious attention. The lovely trees block all satellite service, but there's cable available. Had no issues with the reservation. Requested one of the few pull-throughs and had a site number (311) before we arrived. Reception staff was very friendly and helpful as were the camp hosts (two). Had a "water front site" but was completely overgrown with trees and brush, so there was NO advantage of having this site. The entire campground was thick with trees and brush so maneuvering our 42 ft long fifth wheel through the figure-8 roadway a real trick, but it CAN be done. Was 50A FHU with ample water pressure. Little TV reception and NO satellite reception (roof mounted) except for a few sites that had portable dishes. Cable box available with $50 deposit and worked well. Could not receive any cable channels without using their converter box. Rented a canoe there, also rented a fishing boat at the marina, but you have to do a CBT first. The paddle boat course is 45 minutes (free). The power boat course is 4 hours (free). Do it before you attempt to rent or reserve. Trash bin emptied but recycle bin which was overflowing with trash went unemptied for entire 8 days we were there. Trash cans near shoreline were also overflowing onto the ground. Did not see homesteaders. No decks, etc. Overall nice place. Host is exceptional campground is overrun with trees and weeds it's hard for a big motorhome to even get through the park hooking up the cable system is difficult and if you don't have long enough cables can't do it there is dog poop everywhere and a lot of homesteading it looks as though half the sites are filled with active-duty members homesteading they've even lost our mail. We were extremely disappointed in this RV park since we love the Fort Lewis post. First, the prices quoted on this website are out of date.We paid $28 for a full hook up site for one night. Cable TV requires a converter box which means a $50 deposit. Since the office where you receive and return the box has business hours if you arrive late or plan on leaving prior to 9:00AM you cannot have a cable box. Antenna TV reception was extremely poor in our site (#210) with only Fox and a shaky ABC available, plus the usual junk channels. Wifi is available only in the common building and I am told in loop 100. We stayed in loop 200 and had zero wifi signal. The bathrooms were extremely dated and poorly maintained. The tiles along the baseboard were all cracked, broken or missing. There were many holes in the walls where racks or shelves had been removed. The showers are push button water-savers. You have no control over the water temperature, you press a button and get warm (not hot) water for 30 seconds then it shuts off. You must push the button every 30 seconds to keep the water flowing. Our pull through site was overgrown with brush that scraped our trailer. The septic connection was simply a PVC pipe in the ground - no threads and no cover other than a rock. It would surely smell bad on a hot summer day. Also, the septic hole was located far forward in the site requiring a 20 foot septic hose. Traffic noise from Interstate 5 was a constant loud drone outside. Our rig is well insulated so we did not notice it with the windows shut but in the summer with windows open it would be a major annoyance. For $28 this is definitely not worth the price. First off we had the dreaded space #207. Really not bad at all except no sewer hookup, 30 Amp. Great location. Nice company. I tried for weeks to update but like other RVers and I agree, there paper reservation system has got to go. Ha written in a large format notebook, geez. We did not get upgraded but those that did, had days split between a couple of sites. The grounds need a good trash cleanup. Lots of small and large bits of trash everywhere. Although we did not stay at the cabins next to the campground? I think people must take their dogs over there to poop (Gopher), disgusting. Spaces aren't quite level so it will take a few blocks to help. People up front can answer all your questions. Rental items available. Outfitter retail store has lots of outdoor items. Will accept FedEx. There is some remodeling going on at the laundromat/showers. Looks very nice and is clean. The smaller restroom needs to be bulldozed as it has rotted in place. Be careful of children on bicycles! The scenery is beautiful and peaceful in the mornings. Choppers fly all hours M-F. We were unable to use our satellite because of the trees. Cable is available BUT BE SURE to ask for a cable box. I went two days before someone told me a box was needed. Free. Was charged $10 per day as a change fee. To change the reservation. There is ALWAYS a problem between reservation and checkin. Lousy reservation system. We had reserved a 50 amp full hookup waterfront site 90 days before our stay and put a deposit down. When we arrived, we were given a 30 amp site adjacent to the busy main road that barely fit our 40' motorhome. The staff said whoever took our reservation probably just wanted to give us a site, any site, and wasn't paying attention to our request. Yeah, right! Other nearby campgrounds were booked because of the golf tournament in Chambers Bay. Our site was overgrown with knee high weeds and dry grass. Previous campers had left trash (xmas lights, confetti, plastic cups and lids, dead flowers, kitty litter, dog poop, cigarette butts) all over the site. We had to rake. It was disgustingly dirty. We took pictures and reported it to the lodging office because we didn't want to be charged for leaving a dirty site like their rules stated. The staff member we reported it to behaved as if a dirty site was normal. The campground does not trim trees away from the roadway either so our motorhome could not avoid hitting 3 branches on the way in and out. They do not enforce their own rules and turn a blind eye to unleashed dogs, or people leaving their sites dirty or multiple vehicles in their sites. The site next to us had two trucks, a boat and a motorcycle parked along with their 5th wheel. There are signs everywhere to not park in the grass but where do you park all those multiple vehicles if not on the grass? It could be an awesome campground if they just took care of it and enforced their own rules. Lanes are paved and narrow, sites are paved requiring minimal leveling. Wi-Fi is only strong in or near the common rooms. Elsewhere it's nonexistent. No cable and with the trees, satellite reception isn't good. The only good things about this park were the price and proximity to Seattle and Tacoma. They take reservations but you can never be sure you'll end up getting what you actually reserved. 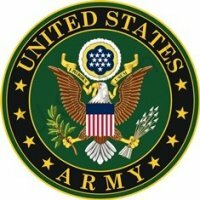 I asked if they ever confirm reservations with an email the way other military famcamps do and the staff member just shrugged and said they aren't required to. They don't seem to care or like their jobs much. Won't return. 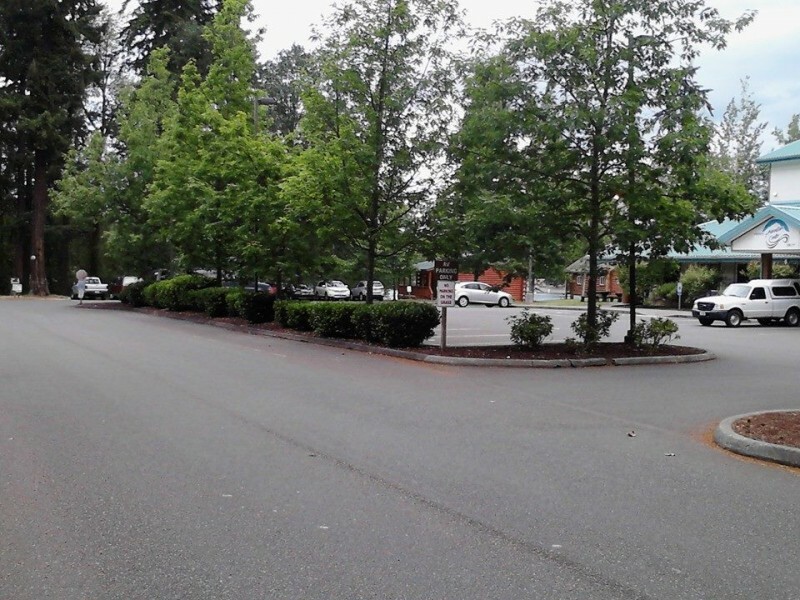 What can we say, just picture perfect, nestled next to American Lake, near the commissary and PX, 5 minutes to I-5, 20 minutes to McChord AFB. Last reviewer must have been at a different park. We found the staff helpful, attentive and accommodating. Our site (120) was a large pull thru parallel to the roadway convenient to the entrance of the park, we had great wi-fi and cable. There were two common area that had showers, laundry, toilets and tv rooms. Everything was clean and tidy at all times and we were there in the rainy season. No bad points worth mentioning. We have stayed at 11 military parks. They need a better reservation system like it has been posted in the previous reviews. When we were making reservations, the binder did not equal what was in the computer. There was only one (older) lady who knew what she is doing. The others, including the men, either need not be there because of a bad attitude/rude and/or need training on how to run the RV park. I never saw any maintenance of the park and never saw any of the workers make any daily patrols to inspect the park etc. They moved us to one sight and the water was leaking so bad, we had to use our own on-board storage water and the front desk never knew about it. The bushes were over grown and looked like they haven't been attended to in years. Thank goodness for the grown trees in the park that it makes it beautiful. The park needs new management. I rated the amenities/facilities a 5 because of the nice gym, bx, commissary on base. I would give cleanliness/hospitality a ZERO if I could. The front gate to the JBLM, what can I say: They were the most professional when we drove through every time, it makes me proud. This is an older park that is totally covered with trees. The cable TV takes a special box that will not work in most motor homes, due to the entertainment systems. You would think that a customer as large as this base would be able to get the cable company to provide unscrambled cable channels. Satellite systems will not work due to the trees that cover everything. We had problems with the power when we first arrived and the staff sent the repair people to the wrong campsite. Finally we were moved to a site that had a working power system. The campsites are not cleaned at all. There is trash left over from previous campers and ashes from years past fires all over the ground. We stay here because of children and grandchildren living in the area. Lake side campsites which are more expensive do not have a view of the lake because of the trees. Getting here was easy off of I5. A pull over place provided for check in. Staff was friendly, helpful. What hurts this CG is these same people are also working the store for booking all activities and sales of outdoor equipment. The CG is a little unusual in site layout and sizing. I think it was designed when RV's were smaller. Each site is unique is layout and size. I have what is a sideway pull through and found it to suit me. My awning area was facing the woods, very private. I haul a 32' fifth wheel with no problems, but when driving thru the park, watch your turns. We loved the wooded quite park and it is one of the better ones. the cable box was no issue with me, I arrived during normal hours, they swipe your card for a deposit, return it, when I returned the box, they gave me the unprocessed card swipe for my disposal. I can say the staff, all I encountered was helpful and pleasant. We checked in this afternoon. The check in process is not pleasant. We made a reservation a couple of months ago and were assigned space #121. The picnic table is on the wrong side and by the amount of spider webs on it, it has not been used for a very long time, plus it is right by the sewer receptacle. We barely have room to put our slides out and walk around on the door side of our coach. As previous reviews have stated, there is NO WIFI or satellite TV reception, and very little antenna reception. And if you want cable you have to ask for the cable box before the store closes at 5:30. When we checked in they didn't bother to tell us that we would need a cable box to get cable channels. We were planning on staying for 2 weeks but will pay the $10.00 fee to cancel and find another RV park in the area. We are in a motorhome. I really like Ft. Lewis Travel Camp; it has a lot of amenities, i.e. you can rent a motorized boat and there is a very good camp store; 2-commons areas with laundry facilities, and a wonderful view, especially by the lake. If you are looking for the Brown Sign for the camp, you won't find it. I am submitting a picture of the sign that you need to look for. Turn before the sign and park along the scrubs on the right. Be sure to have plenty of leveling material as many of the spots are not very level. There are many pull through sites, but the nicest spots are the back in ones. There are trees between the spots, so there is a lot of privacy. The spots and roads are all nicely paved, but I agree about the maze set up. There is good water pressure, but forget about satellite TV and local over the air channels. You can check out a cable box and that works great. They sell propane and can fill your RV as well. The lake is beautiful and there is a fishing dock (license required, sold in office). WIFI is available, but you have to be by the office or the commons building to use it. We do not use the bathrooms or laundry. We stay in a 36' RV and pull a 28' enclosed trailer. We would stay here again. Very tough getting through the maze at the campground to your site. Big Rig friendly is questionable. Lake side spots did not guarantee a view of the lake but you will pay $5.00 extra per day for the spot. 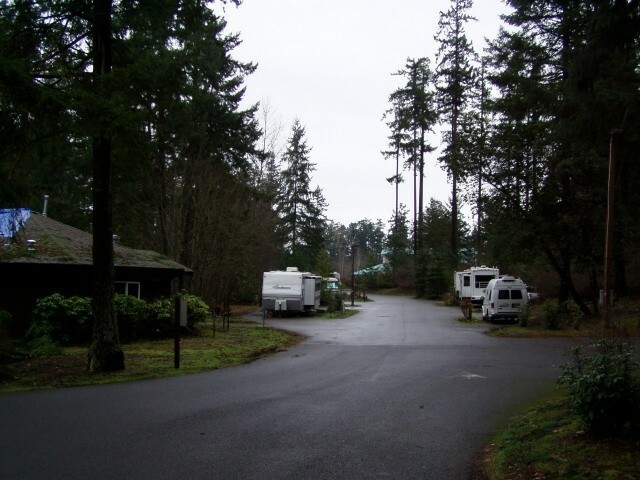 The RV Park is great and has the potential of being better. Everything that is stated in the Campground Information is fact. Our site was classified as a lakeside site but that does not imply a lakeside view. There are perhaps 3 or 4 sites that can “see” the lake. 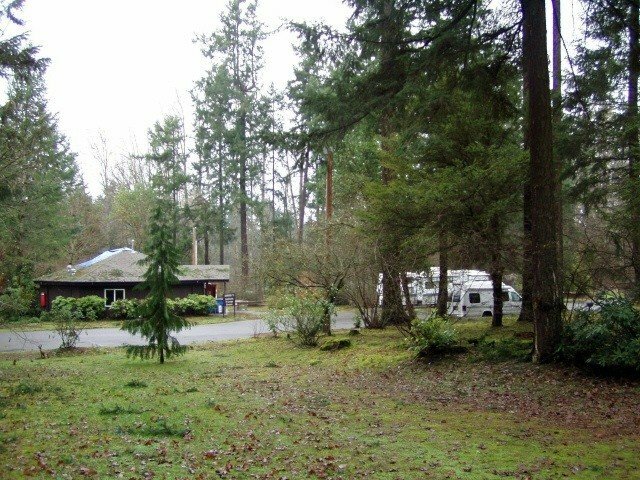 The Campground is located in a beautiful wooded area with dense underbrush making a view of the lake almost impossible. Satellite reception is non-existent. They do have cable TV in the Campground but you have to borrow a satellite receiver from the office. The staff were courteous and do their best to be helpful. 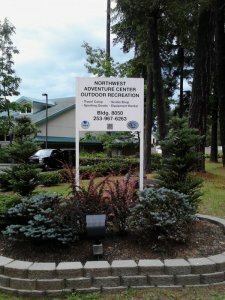 It is obvious that they have multiple duties and responsibilities working at the Northwest Adventure Center, which by the way, has a good assortment of outdoor equipment for sale or rent. There are two camp hosts residing in the Campground but you never see them. To the best of my knowledge there are no walking trails near the Campground. For those of us that like to go on long walks we have to fulfill that desire by walking on the roads or sidewalks. Overall, we really enjoyed our stay at Ft. Lewis and look forward to returning at some time in the future. I would like to share a few things we discovered while we played tourist. If you are planning to visit Mt. Rainier National Park, plan for a very long and tiring day. It would probably be best to plan multiple days and/or possibly stay overnight closer to Mt. Rainier NP. We attempted to see and enjoy as much as we could in one day at Mt. Rainier but fell short of our goals. On the plus side, we have a good incentive to return. Also, you can save a little time by going through Ft. Lewis (Main) to Stryker Road and out the East Gate to Routes 507 and 7. I had a “boy’s day out” one day and took a ride to McChord AFB - I wanted to visit the Air Museum. I enjoyed my little adventure. The museum consists of two parts; a small building near the PX (BX)/Commissary complex, and static displays of well-maintained aircraft near the airstrip. What I found enjoyable was talking to the volunteers at both locations. They make a special effort to greet every visitor and provide a wealth of information about Air Force aircraft and McChord AFB history. 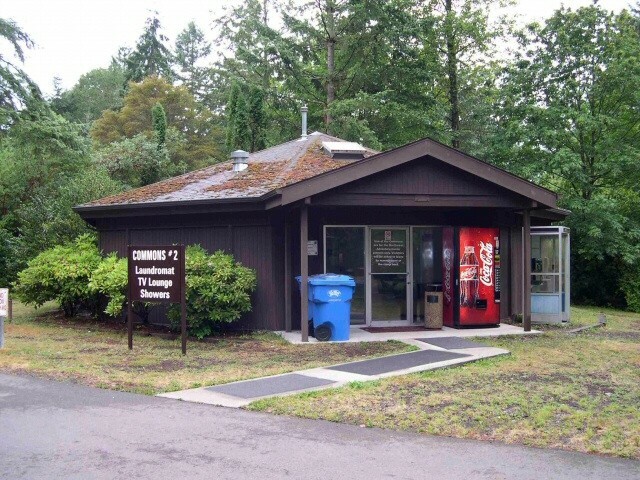 While at McChord I also visited the BX, Commissary, and Holiday Park FamCamp. The BX seems to be similar to Ft. Lewis, but less crowded. The Commissary is small with narrow aisles. 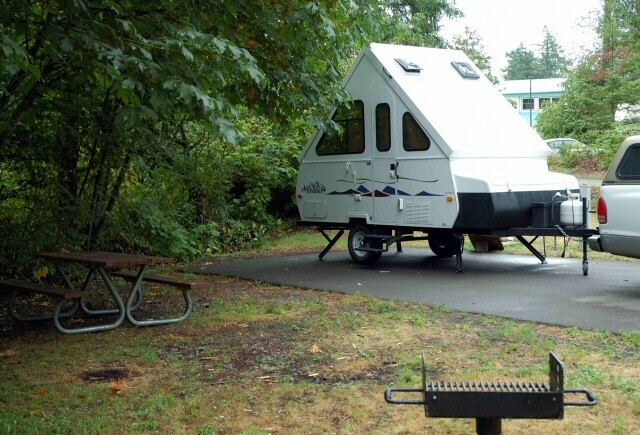 The RV Park at McChord appears to be a possibility for a future visit to the Tacoma area. Finally, one day we went to lunch at the Tacoma waterfront. The waterfront is not as picturesque as other waterfront’s that we have visited but the experience was enjoyable.